Seth Bhojraj Hassomal Charitable Trust was established in the year 1969.It was formed with the prime objective of giving back to the society, for improving the quality of life of people. The Trust is run with a lot of passion to propagate the philanthropic vision of the Honourable Trustees. The Trust supports a span of worthy causes by supporting various NGOs/organisations that operate with less privileged communities in India. The primary focus is to broadly support projects in the areas of Health care, Education & Women empowerment, with the core aim of alleviating poverty in the Country. The model of implementation is to partner with likeminded NGOs/Organisations in the relevant field. 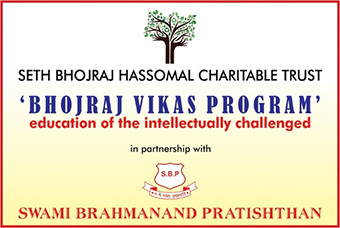 Swami Brahmanand Pratishthan has partnered with Seth Bhojraj Hassomal Charitable Trust to support the students with intellectual difficulties by imparting vocational skills at the Falguni Vocational Centre. This association commenced in the year 2017 -18, and benefitted the 42 children studying at the Centre and helped them to gain some marginal skills. We are continuing this association for the year 2018-19 for further enhancing the skills of these students. Note: * mark fields are mandatory.